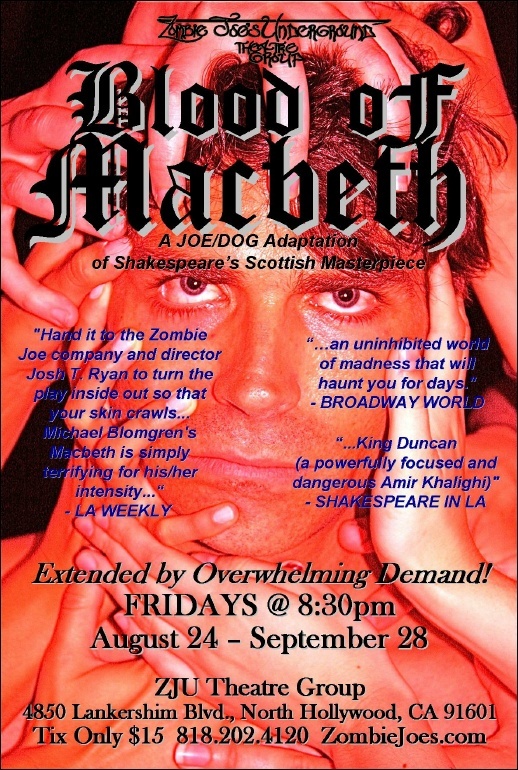 By popular demand, Zombie Joe’s Underground Theatre Group has extended Blood of Macbeth for (6) additional Fridays, August 24 – September 28. All performances begin at 8:30 pm. Directed by Josh T. Ryan and starring Michael Blomgren as Macbeth, this is the Scottish play as you’ve never seen it before. It’s “renegade Shakespeare, brilliantly alive, full of bold choices and a brash in-your-face sensibility that makes you feel the action rather than intellectualize it.” Click Here for our full review. The cast also includes Amir Khalighi (Duncan), Steve Madar (Macduff), Willy Romano-Pugh (Banquo), David Wyn Harris (Fleance), Roger Weiss (The Captain), and Chelsea Kurtz (The Murderer), along with Lizzie Bassett, Jacqueline Baxter, Ren Harris, Beth Ricketson, Lauren Velasco, and Helene Udy as the Twisted Sisters.